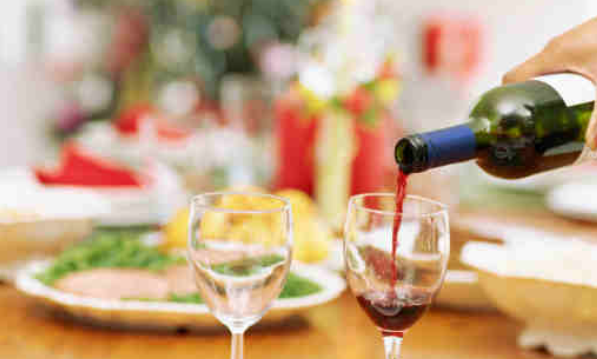 Here's a guide for serving alcoholic drinks when hosting a holiday party at home. Throwing a holiday party? Good for you. You know the rules. Don’t get drunk at your own party and don’t hook up with someone from your office. Now, with that out of the way, let’s talk about the wine and cocktails. 1. What should you serve? The simplest answer is, “Whatever you want. It’s your party,” says Sharon Sevrens, sommelier and owner of Amanti Vino wine shop in Montclair, N.J.
Just don’t open up the good stuff. “Save those expensive bottles for more intimate occasions and for people who will appreciate them,” say Mike DeSimone and Jeff Jenssen, authors of Wines of California Deluxe Edition. But consider starting with a bubbly. “Just the sound of opening a bottle of bubbly is super-festive,” says Joe Campanale, executive beverage director/co-founder, Epicurean Group. You really could do an all-bubbly night. 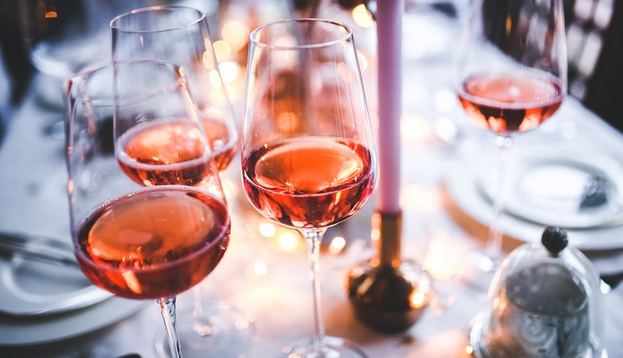 Maybe pick a Cava, a Spanish sparkling, a rose champagne, and a lambrusco, which is a deeper red Italian sparkling. “It will be very festive and all of these wines are great with food,” says Campanale. If you don’t want to do bubbles all night, then, you need to offer a white and a red wine. And, depending on the number of people, you may want to consider two whites and two reds, says Sevrens—one light, one heavy of each. Just know that you don’t need to offer every wine varietal. You’re not a wine shop so no need to pretend to be one. Just pick what you like and go for it. Remember people are just happy to get free drinks and apps. And instead of stocking a full bar, which can get super expensive, consider making a signature cocktail, suggests Sevrens. Just make sure you select something you can make in large batches—like a punch or even pomegranate sangria because the colors scream “holidays!” This way, you’re not playing bartender all night. If you do have cocktail drinkers coming, it is always nice to have a good bottle of whiskey and some ice cubes around for those who prefer something stiff, suggests Campanale. Well, you know your crowd. But if it's co-workers you haven’t been out boozing with before, consider this conservative estimate. “People drink two drinks in first hour, then one in each additional hour,” says Sevrens. Makes sense. When you first get to the party you tend to drink a little faster after a long day. So if you’re having a four-hour party, budget five drinks per person, say Sevrens. Now the number of bottles. This requires some math. A one-liter bottle of alcohol (approximately 34 oz.) will make you about 22 mixed drinks (1.5 oz. per drink), so if you know how many guests are attending and what your signature cocktail will be, you can figure out how much you need to buy. The number of wine bottles will depend on who’s pouring. If you have a professional bartender, you’ll probably get six glasses per bottle. If your guests are pouring, odds are good they will have a heavier hand and you will only get four glasses per bottle. And maybe consider pulling out your magnums, or large format bottles, says Campanale. "They are extra festive, you then have less bottles to open and can focus on the party more,” he says. I am the first to admit I often forget about water when I am out. I chat away and the hostess with the mostest keeps refilling my glass. It’s generally around 7:00 a.m. the next day, when my headache is full-blown, that I remember that I missed the water. So be sure to keep tons of it on hand at your party, reminds Sevrens. And you don’t need to spend money on bottled water. Just put pitchers everywhere. Or pull out those beverage dispensers with the spigot that you used for fun summer drinks. Fill them up and throw in some fruit. And remind your guests to drink water all night (and probably take an Uber or GrabCar home). That way they wake up the next morning remembering the great time they had at your party, not the fact that they need Excedrin.